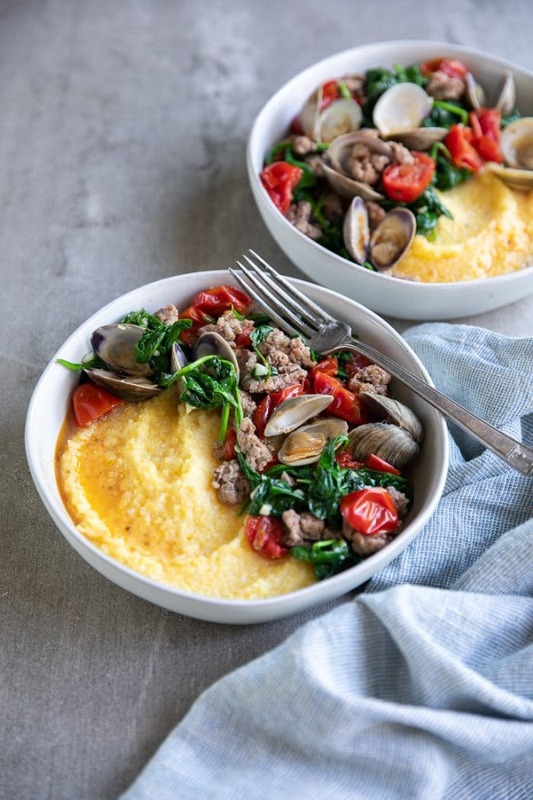 Drunken Clams with Italian Sausage and Polenta is an easy and delicious anytime dish made with sauteéd spinach, burst cherry tomatoes, littleneck clams, and sweet Italian sausage served over creamy polenta. Ready in just 30 minutes, these Drunken Clams with Italian sausage are loved by my whole family- especially my 4-year-old who discovered that clams are his new favorite! Before I go any further, I have a confession. This is my first time ever cooking polenta. I can assure you that there isn’t anything intentional behind this polenta ignorance. Only that for whatever reason I never picked up the bag off the shelves and committed to cooking it for my family. Anyway, I stumbled across this recipe the other week and thought I would try it. Or, at the very least, try my version of it. 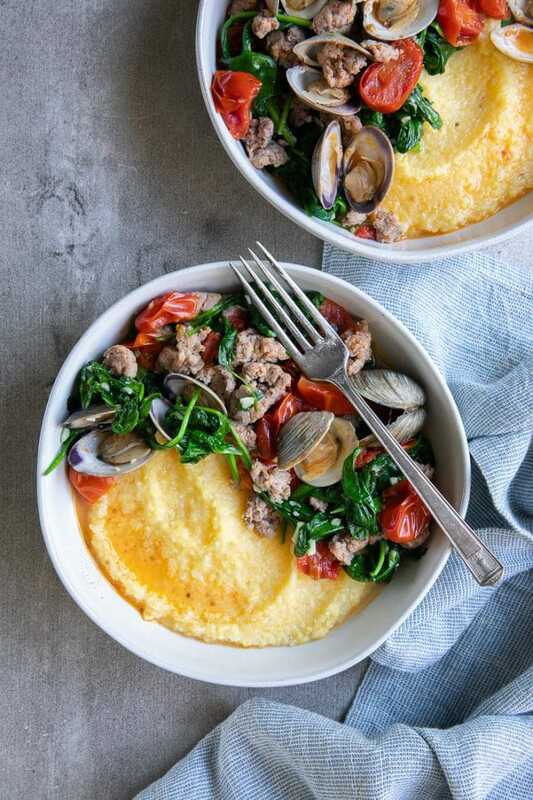 Made with sweet Italian sausage, cherry tomatoes, fresh spinach, and clams simmered in white wine, I knew there was a little something for everyone in this recipe. But, you guys, Drunken Clams with Italian Sausage and Polenta was so much more than even I could have ever imagined! And, if I’m being completely, 100% honest with you, I think it may even top my top 10 favorite recipes of all time list. How could it not? 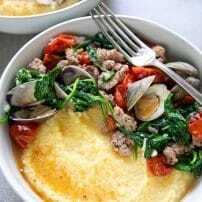 These Drunken clams with Italian sausage turned my child into a clam lover and opened my eyes to the wonderful world of polenta! 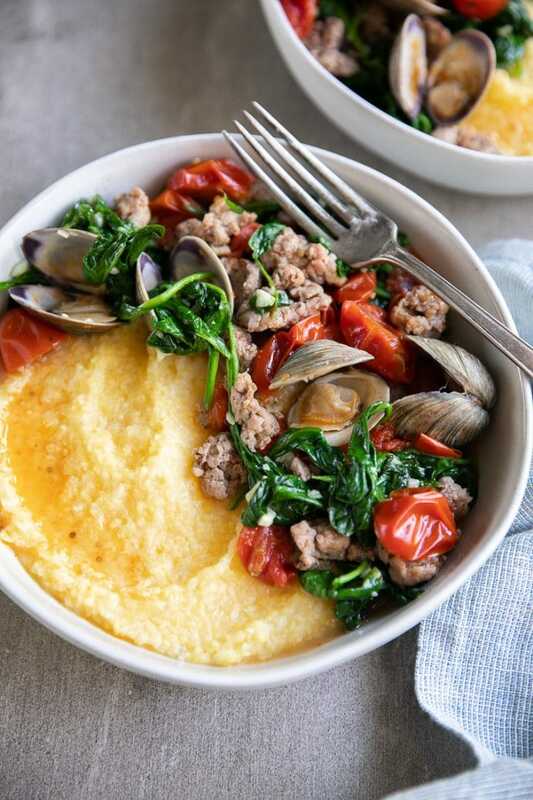 I know that for a few of you the polenta and littleneck clams may be a challenge to track down. Don’t worry, we can do this. The polenta is easy thanks to a little place on the internet called Amazon. You can purchase the exact same polenta that I used HERE. It tastes great and cooks quickly. Two things I like to hear when it comes to food. Clams, on the other hand, are often a bigger challenge. The best bet is to ask your local fishmonger or supermarket butcher to see if they can order it. In most cases, they can. Or, if you live in a larger, more populated city or suburb, then many markets will already have fresh clams delivered daily. Polenta is made from ground cornmeal. It’s actually quite similar to grits, so chances are, if you have had one or the other and liked it, you’ll probably love the other. Polenta is made from the corn variety known as flint corn. 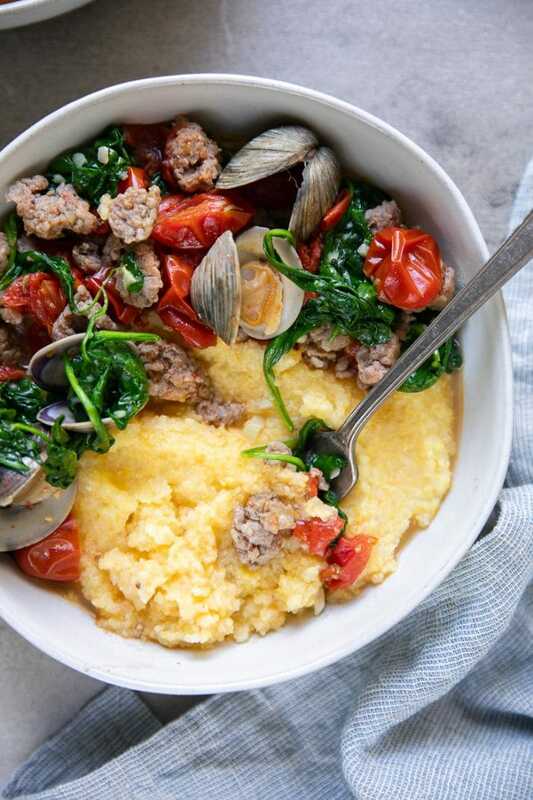 Typically cooked low and slow, an instant polenta has also been engineered. Or, if you really hate cooking, you can also buy polenta in a tube. It seems that there are no rules when it comes to this creamy Italian comfort food. Whether you want to keep this recipe surf and turf or make it strictly by the sea, you will have to learn how to cook some clams. 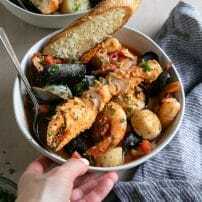 Don’t worry, my friends, cooking clams couldn’t be easier, like in this reader favorite Cioppino Recipe. And cooking clams in a delicious white wine and garlic mixture (aka drunken clams) couldn’t be any more delicious. Gather the essentials- olive oil, shallots, garlic, dry white wine, and unopened clams. Heat the olive oil with the shallots over medium heat. Cook the shallots until they are soft. Add the garlic with a pinch of salt and cook for just one minute before adding the wine, about one cup, to the skillet. Bring to a boil. Add the clams and cover. Cook the clams until they have opened, approximately 5-7 minutes. 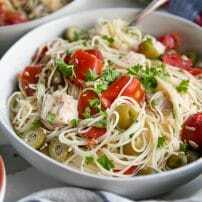 Toss with your favorite carbs. This is Drunken clams in their most basic form. Ok, you don’t need the shallots. But everything tastes a little better with shallots. Is this recipe Gluten-free? Yes, this recipe for drunken clams with Italian sausage should be gluten-free. That said, if you have extreme sensitivity to gluten, please read all labels first. 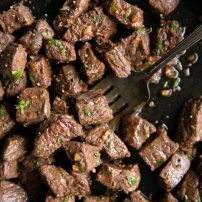 Is this recipe healthy? I will probably always answer questions like this the same way, so…yes and no. There are extremely healthy components to this dish and other parts that should be eaten in moderation (translation- sausage). That said, enjoy in moderation, but perhaps not every night. Are Drunken Clams vegetarian? No. Just no. Is this dish dairy-free? 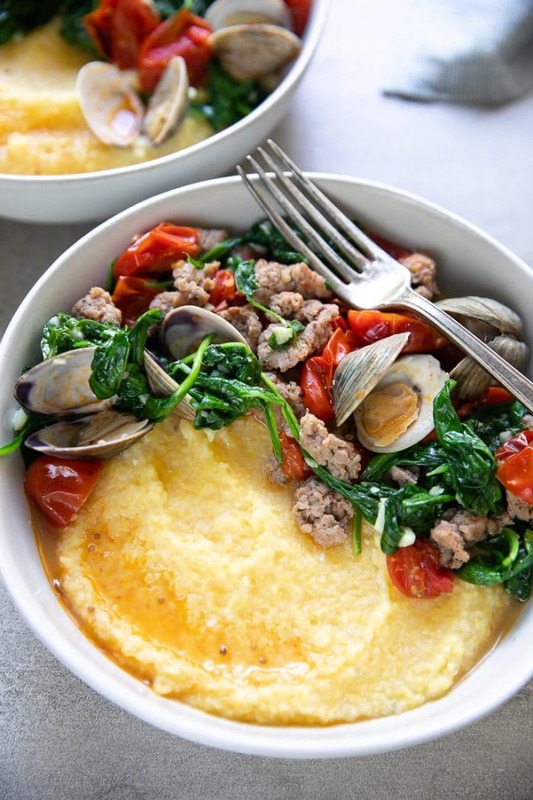 The only thing that will make these drunken clams and sausage not dairy free is if you decide to add butter to the polenta. Otherwise, totally dairy free. That said, I highly recommend a little butter and maybe a little milk. Ok, awesome. With all that noted, here are some ways to modify this fantastic dinner to suit your needs. If you can’t find clams or you don’t like clams, skip them. Add shrimp instead. Experiment using different greens. I personally love spinach, so that’s why spinach was the obvious winner for me and my family. But other greens such as kale or chard will work as well. If you don’t eat pork, add ground chicken or beef instead. You don’t have to use polenta. Drunken clams and sausage also taste great with noodles…or grits. Add a little heat by adding 1 teaspoon of crush red chili flakes to the sausage as it cooks. If you try making this Drunken Clams with Italian Sausage Recipe, please leave me a comment and let me know! I always love to hear your thoughts. DON’T FORGET TO PIN AND SHARE THIS EASY AND DELICIOUS DRUNKEN CLAMS RECIPE TO PREPARE AND SERVE ANY DAY OF THE WEEK AND WITH ALL YOUR FAMILY AND FRIENDS. Cook the polenta according to package instructions. When finished cooking, remove from heat but keep the lid on the pot to keep warm. Set aside until ready to serve. Add the olive oil to a large skillet over medium heat. Add the shallots to the skillet and sauteé for approximately 2-3 minutes, stirring frequently. Stir in the garlic with the shallots and cook for one minute more. Add the spinach to the skillet and sprinkle with a pinch of salt. Continue to cook until spinach is cooked and tender. Transfer the shallot and spinach mixture to a plate. Cover to keep warm. Using the same skillet, cook the sausage over medium heat, stirring frequently and using a wooden spoon to break apart the sausage into smaller pieces. Once the sausage is nearly cooked, add the tomatoes and the wine. Bring to a boil. Add the clams to the skillet and cover. Cook the clams over medium-high heat for approximately 5-7 minutes, or until clams have opened (discard any clams that have not opened). Return the shallots and spinach to the skillet and season with salt and pepper, to taste. To serve, divide the polenta among bowls and top each with 2 teaspoons salted butter. Divide the clams, sausage and cooking liquid among the bowls and top with fresh parsley, if desired. Enjoy!